Â© 2016 Caroline Gilbert. This is an Open access article distributed under the terms of Creative Commons Attribution 4.0 International License. The dendritic cells (DCs) play a fundamental role (messengers between innate and adaptive immunities) in the development of immune responses. They can be activated by the danger signals (DAMPs: Damage-associated molecular pattern molecules; or PAMPs: Pathogen-associated molecular pattern molecules) that modulate the expression of specific receptors on their surface, cytokines producing (pro-inflammatory agents) and release exosomes in an extracellular space. The majority of VIP (Vasoactive Intestinal Peptide) that is usually found in the digestive tract plays an anti-inflammatory role by reducing DCs activation by PAMPs. This article presents the results of a research whose objective was to study the effect of VIP on the modulation of DC responses after an-activation by lipopolysaccharide called LPS (PAMPs) and by Monosodium Urate Crystals MSU. (DAMPs) in the presence or absence of VIP various cytokines dosage done using HEK- Blue™ line indicator and ELISA method, show that LPS and MSU crystals induce the release of pro-inflammatory cytokines by DCs in presence of VIP. These observations showed that PAMPs and DAMPs could participate in DC activation during an infection as in the case of infection by HIV-1, and the presence of VIP could play an inhibitor effect on this activation and indirectly on the infection. To maintain their integrity, tissues are made of immune cells including dendritic cells (DCs) which use a variety of receptors called Pattern Recognition Receptor (PRRs) that enable pathogen recognition. Activation of these receptors accelerates the innate immune response recognizing conserved structural patterns present on micro-organism envelope, PAMPs (Pathogen-Associated Molecular Patterns). These PAMPs can be bacterial components such as LPS (Lipopolysaccharide: component of the wall of gram-negative bacteria), or even of the CpG (unmethylated Cytosine-Guanine nucleotide repeats) which are repetitions of non-methylated nucleotides abundantly found in DNA (deoxyribonucleic acid) of bacteria and viruses. However, innate immunity can also be triggered by endogenous molecules called DAMPs (Danger-Associated Molecular Patterns) or danger signals. These DAMPs are molecules released by cells that have undergone stress or damage and can activate the immune response or PAMPs. The DAMPs that catch our attention is MSU crystals (Monosodium Urate) because they were identified as the main endogenous danger signal released by damaged cells. These crystals will enable APCs and release pro-inflammatory cytokines such as interleukin 1β[4,5]. The cytokine plays a main role in activating the immune system because it participates in the recruitment of inflammatory cells and is involved in cellular proliferation, the differentiation and in the apoptosis of inflammatory cells[4,6,7]. However, to maintain homeostasis, tissues produce molecules that can limit damage. The neuropeptide Vasoactive Intestinal Peptide (VIP) are widely distributed molecules in the body and have a wide biological activity spectrum. Among their outstanding features, there is their role as modulators of cell proliferation and differentiation, especially in the immune system. They are produced by the innervation of lymphoid tissues but also by some cells, particularly Th2 lymphocytes. The receptors for neuropeptides are expressed by different cell types of the immune system (DC, LB and LT) which regulate proliferation, differentiation and migration. It was demonstrated in the literature that the DCs express VIP receptors and that VIP inhibits the expression of co-activator molecules, CD80/ CD86 in mature DCs and reduce their ability to activate T ymphocytes. Also, it has been observed that neuropeptides can directly affect the maturation and migration of DCs toward secondary lymphoid organs to prevent an immune response because they inhibit the migration of mature DCs in a dose-dependent manner in response to the chemokine CCL5 (Chemokine (c-c motif) Ligand 5) and CCL19 (Chemokine (c-c motif) Ligand 19). In the case of HIV-1 infection, the VIP would block the HIV-1 fusion with target cells[12,13] and reduce viral replication in the infected macrophages. This study shows that PAMPs and DAMPS trigger DCs to release active pro-inflammatory cytokines and that VIP decreases their effects. Different reagents were used in particular, the lymphocyte separation medium (LSM), Hank’s Buffered Salt Solution (HBSS), Phosphate Buffered Saline (PBS), RPMI 1640 medium (Roswell Park Memorial Institute) and Dulbecco’s Modified Eagle’s Medium (DMEM), Fetal Bovine Serum (FBS), penicillin, streptomycin and primocine (preventing the contamination of culture medium by inhibiting growth of Gram-positive and Gram-negative bacteria), glutamine (nutrients for cellular growth), LPS, GM-CSF (Granulocyte Macrophage Colony-Stimulating Factor), IL-4 interleukin, accutase, MSU and VIP. The FBS was decomplemented and ultra-centrifuged to remove exosomes that may be present. The LSM, HBSS, PBS, culture media RPMI 1640 and DMEM, the FBS, penicillin, streptomycin and glutamine were purchased from Wisent Inc. (St-Bruno, QC, CAN). The primocine and LPS were purchased from InvivoGen (San Diego, CA, USA). GM-CSF was purchased from GenScript (Piscataway, NJ, USA) while IL-4 comes from R & D Systems (Minneapolis, MN, USA). Accutase is available at Innovative Cell Technology Inc. (San Diego, CA, USA). MSU crystals were graciously provided by Dr. Paul Naccache, University Laval (Québec, QC, CAN). VIP was purchased from the Neuropeptide (Strasbourg, Alsace, FRA). The secondary antibodies were from Jackson Immuno Research Laboratories Inc. (Baltimore, PA, USA). PBMCs were isolated from healthy human blood by density gradient using LSM. The ring of mononuclear cells obtained was collected and washed three times with HBSS IX (Hanks’ Balanced Salt Solution). Then PBMCs were then cultured at a concentration of 5 x 106 cells/ml in RPMI 1640 supplemented with 10% FBS and in the presence of antibiotics like penicillin (100 U/ml), streptomycin (100 U/ml), primocine (100 pg/ml) and amino acids like glutamine (2 mM). Among these PBMCs that were cultured, a portion of PBMC were treated or not with the VIP (10-6M) for 2 days at 37°C. Another portion of PBMC were stimulated with MSU crystals (0.15 mg/ml), in presence or absence of VIP (10-6M) for 2 days at 37°C. Finally, a portion of PBMC was kept for differentiation into DCs. To obtain DCs, a positive selection of CD14+ monocytes have been performed from PBMCs obtained by the method described previously. The selection was made using magnetic microbeads to which anti-CD14 antibody is attached (Stem cells, Vancouver, Canada). Once isolated, CD14+ monocytes were cultured in 6-well plates, at a rate of 3 x 106 cells/well in 3 ml of RPMI 1640. IL4 (200 U/ml) and GM-CSF (1000 U/ml) on days 0, 2 and 4 to ensure their differentiation into immature DCs. After 5 days of differentiation, some immature DCs were grown at the rate of 500,000 cells/wells in a volume of 500 μl in duplicate in a 24-well plate with or without MSU crystals (0.15 mg/ml) for 48hrs at 37°C in the presence or absence of VIP (10-6M). Then the other portion of DC’s were cultured at the rate of 500,000 cells/wells in a volume of 500 μl in duplicate in a 24- well plate with or without LPS/IFNγ (1 μg/ml/1000 U/ml final) during 48hrs at 37°C in the presence or absence of VIP (10-6 M). Treatment of iDCs (i.e., monocytes treated with GM-CSF and IL-4) with LPS and IFN-γ is a well-known method used to induce full maturation of DCs[15,16]. To measure TNFα or IL1β cytokines present in the supernatants recovered, an Enzyme-Linked Immunosorbent Assay (ELISA) (eBioscience, San Diego, CA, USA) and an indicator line HEK-Blue™ TNFα/IL1β (eBioscience, San Diego, CA, USA) have been used. This indicator cell lines were transfected by a SEAP (Secreted Embryonic Alkaline Phosphatase) reporter gene which is under the control an NF-κB promoter. SEAP secretion, specific for the activation of NF-κB path by TNFα or IL1β was measured by spectrophotometer through the use of Reagent Quanti-Blue™ (reagent which becomes blue/purple in the presence of SEAP). The ELISA test used (“Human TNF-alpha ELISA Ready-SET-GO!”) by eBioscience is an enzyme-linked immunosorbent assay for the quantitative detection of human TNFα. It has been conducted according to the instructions of manufacturer. Statistical analysis was performed by ANOVA (oneway ANOVA) followed tests of Tukey multiple comparisons. These analyze were performed using the software Prism 5 (Graph Pad Software, San Diego, CA, USA). P values less than 0.05 were considered significant. * = p < 0.05; ** = p < 0.01; *** = p < 0,001. 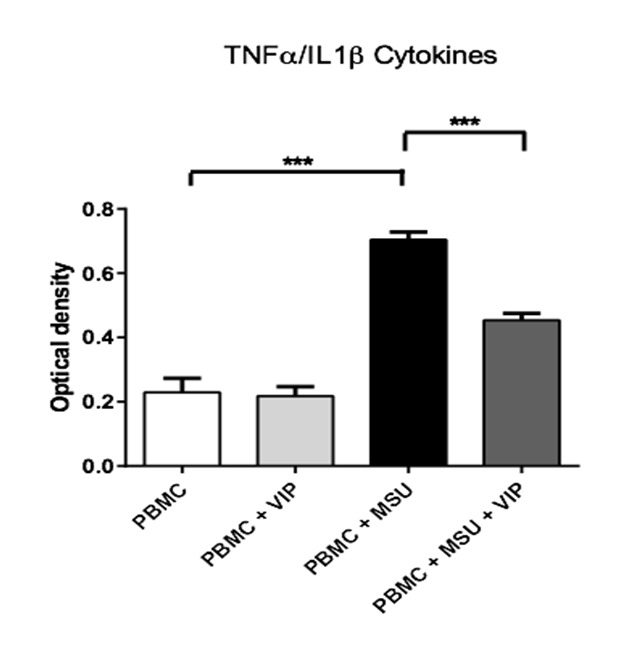 It is known that the production of TNFα/IL1β cytokines is increased in DCs stimulated with LPS and IFNγ[18-20] but decreased by LPS in the presence of VIP[21,22]. However, it is not known if VIP may regulate the release of these cytokines by DCs stimulated with LPS and IFNγ. We are therefore studying the effect of VIP on the production of pro-inflammatory cytokines TNFα and IL1β. To do so, DCs were stimulated for 48 hours with LPS and IFNα, then the supernatants were recovered and cultured with a line of HEK-Blue™ TNFα/IL1β cells for detection of the presence of TNFα or IL1β active cytokines. The results presented in (figure 1) show that the VIP modulates the secretion of TNFα or IL1β by activated DCs with LPS or IFNγ. In the absence of stimulation, no effect of VIP has been observed on the cytokines secretion. These results were confirmed by using ELISA for TNFα. The results presented on (figure 2) indicate a decrease of secretion of this cytokine by DCs stimulated by LPS or IFNγ in the presence of VIP. 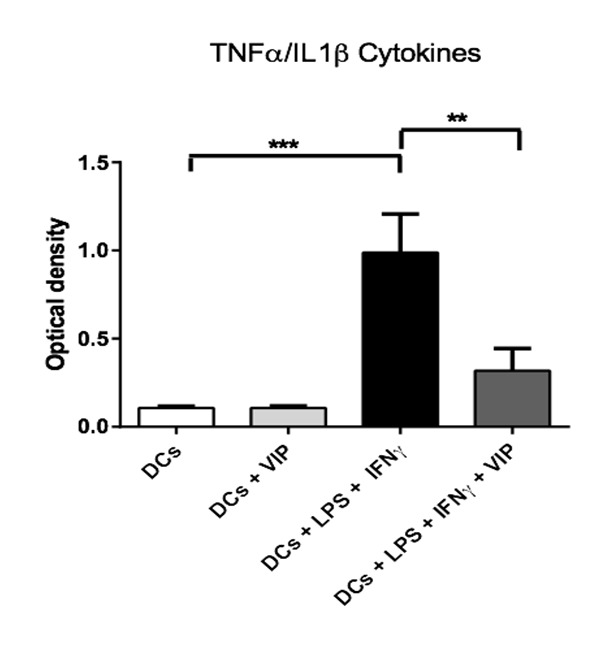 Figure 1: VIP effect on the production of TNFα or IL1β cytokines by DCs after a stimulation with LPS and IFNγ. The immature DCs (500.000 cells/500 μl) have been incubated in the presence or absence of VIP (10-6 M final), and/or LPS/ IFNγ (1 μg/ml / 1000 U/ml final) during 48h at 37°C. Then, the supernatants have been collected and cultured with HEK-Blue™ TNFα/IL1β cells (Invivogen) in order to evaluate the active TNFα or IL1β quantities. 2* = p < 0,01 ; 3* = p < 0,001. (3 donors). Figure 2: VIP effect on the production of TNFα by DCs after a stimulation with LPS and IFNγ. The immature DCs (500.000 cells/500 μl) have been incubated in the presence or absence of VIP (10-6 M final) and/or LPS (1 μg/ml final) and IFNγ (1000 U/ml final) during 48h at 37°C. Then the supernatants have been collected and an ELISA test has been performed in order to evaluate the quantity of TNFα. 3* = p < 0,001. (2 donors). In 2006, Martinon and co-workers have shown that the stimulation of macrophages by MSU crystals causes an increase in the production of IL1β pro-inflammatory interleukins. Our results show that activated PBMC with MSU crystals, synthesize a larger amount of TNFα or IL1β pro-inflammatory cytokines activated versus non-activated PBMCs. It is noted that this increase on the cytokines synthesis is decreased when PBMC stimulated by MSU crystals are pretreated by VIP. However, VIP alone has no effect when PBMCs are not activated (figure 3). Under normal physiological conditions, immune system activation is initiated by the recognition of endogenous danger signals called DAMPs and PAMPs respectively[23,24]. The DAMPs represent products released by damaged tissues while PAMPs are molecular patterns conserved from pathogens. They allow to initiate an innate immune response through recognition and activation of the receptors of the PRRs family expressed in many immune cells like neutrophils and phagocytes especially including DCs. These phagocytes are important in removing pathogens and cellular debris, but also in the development of an adaptive immune response[25,26]. It is observed that in the presence of PAMPs or DAMPs, DCs undergo maturation and migrate thereafter to secondary lymphoid organs where they activate the T lymphocytes[27,28]. Among the PAMPs, LPS could be found in the gastrointestinal tract damaged during infection by HIV-1. Indeed, hundreds of billions of bacteria of the intestinal flora normally line the intestine under physiological conditions. It is observed that LPS is present in large quantities in the blood circulation of patients infected by HIV-1. The presence of LPS in blood could be due to microbial translocation following damage of the gastrointestinal tract and the intestinal epithelium[30-32]. Thus, bacteria may be found in the gastrointestinal tract and participate in the depletion of LT-CD4+. This depletion caused as a result of a chronic immune activation by LPS or other bacterial patterns. In fact, it has been shown that there is a correlation between increased LPS and chronic activation of innate and adaptive immune system. This depletion could also be promoted by an alteration of VIP quantity and function which is usually found in large quantities in the gastrointestinal tracts in a physiological condition and which contributes to tolerance. However, several studies have shown that VIP can act as immunoregulatory on activation of DCs when they are stimulated with PAMPs. VIP significantly reduced the capacity of these cells stimulated with LPS to activate T lymphocytes. We therefore sought to confirm these results but in the presence of IFNγ, because it is a cytokine released by activated T lymphocytes that help strengthen the activation and survival of DCs. Our results show that LPS and IFNγ activate an increase in the production of TNFα or IL1β pro-inflammatory active cytokines through the use of indicator HEK-Blue™. However, this technique does not differentiate TNFα and IL1β cytokines but the advantage of this technique is that it can measure the active cytokines. Therefore, we used ELISA to quantify TNFα and we have confirmed an increase of this cytokine’s production. However, the results confirmed observations of other studies indicating that the production of TNFα cytokines is increased in DCs stimulated with LPS and IFNγ[19-20]. It should be necessary to supplement these experiences with ELISA method which allows determining the IL1β dosage. Finally, we note that this activation may be diminished in the presence of VIP. Indeed, the impact of observed VIP on the activation of the DCs is that this peptide can block the production of TNFα cytokines. Also, when a tissue is damaged, the necrosis cells can release endogenous danger signals called DAMPS and activate the immune response. We therefore wanted to verify if VIP could also have an effect on the activation of DCs when they are exposed to endogenous danger signals. Our results show that the MSU crystals can trigger an increase in the production of TNFα or IL1β pro-inflammatory cytokines by human PBMC and TNFα by human DCs. However, the amount of TNFα produced by DCs is less than when stimulated with LPS and IFNγ. It would therefore be necessary in subsequent experiments to see if MSU crystals can trigger an increase in the production by humans of IL1β DCs. Also, it would be appropriate to understand the difference between the amounts TNFα produced in response to MSU crystals versus those produced in response to LPS/IFNγ. VIP could have a protective effect vis-à-vis the rapid depletion of LT-CD4+ during a HIV-1 infection through: a reduction of the effects of PAMPs and DAMPs, a decrease of DCs maturation, a decrease of the migration of DCs to the secondary lymphoid organs where the virus transmission to T CD4+ lymphocytes takes place, and a decrease of DCs role in the antigen presentation. The DCs are important in removing pathogens and cellular debris. Our results show that LPS, in the presence of IFNγ result in an activation of DCs, and that MSU crystals result in an activation of PBMC. Indeed, these two types of signals increase the production of TNFα or IL1β pro-inflammatory active cytokines. We have shown that VIP neuropeptide allows regulating the activation of DCs stimulated by LPS and IFNγ, or the activation of PBMC stimulated by MSU crystals. Indeed, this peptide reduces the production of TNFα or IL1β cytokines by DCs stimulated by LPS and IFNγ or by PBMC stimulated by MSU crystals. This study will increase our knowledge of the role of VIP molecules in the regulation of pro-inflammatory cytokines. The authors thank Sébastien Simard for his support and expertise with all experiments. This work was supported by catalysis operating grants (MOP 103131) to C.G. from the Canadian Institutes of Health Research (CIHR) HIV/AIDS initiative. C.G. was the recipient of a Junior 1 Scholarship Award from the Funds de la Recherché en Santé du Québec and of a New Investigator Award from the CIHR/HIV/AIDS initiative. C.G. is the recipient of a Junior 2 Scholarship Award from the Funds de la Recherché en Santé du Québec. The authors declare that they have no competing interests. The funders had no role in the study design, data collection and analysis, decision to publish, or preparation of the manuscript. Authors’ contributions: R.B. performed research, analyzed data and wrote the first draft with the help of G.M.M.L. C.G. designed and supervised the study, analyzed the data, wrote and edited the final version of manuscript. All authors read and approved the final manuscript. The work by R.B. was in partial fulfillment of his Master program requirements in the microbiology-immunology program in the Faculty of Medicine at University Laval. Ethics statements: These studies were approved by the Centre de Recherche du CHU de Québec ethics committee, and all participants provided written informed consent. 1. Kawai, T., Akira, S. The roles of TLRs, RLRs and NLRs in pathogen recognition. (2009) Int Immunol 21(4): 317-337. 3. Shi, Y., Evans, J.E., Rock. K.L. Molecular identification of a danger signal that alerts the immune system to dying cells. (2003) Nature 425(6957): 516-521. 4. Shi, Y. Caught red-handed: uric acid is an agent of inflammation. (2010) J Clin Invest 120(6): 1809-1811. 5. Kanevets, U., Sharma. K., Dresser, K., et al. A role of IgM antibodies in monosodium urate crystal formation and associated adjuvanticity. (2009) J Immunol 182 (4): 1912-1918. 6. Martinon, F., Pétrilli, V., Mayor, A., et al. Gout-associated uric acid crystals activate the NALP3 inflammasome. (2006) Nature 440(7081): 237-241. 7. Arend, W. P., Palmer, G., Gabay, C. IL-1, IL-18, and IL-33 families of cytokines. (2008) Immunol Rev 223: 20-38. 8. Iyori, M., Ohtani, M., Hasebe, A., et al. A role of the Ca2+ binding site of DC-SIGN in the phagocytosis of E. coli. (2008) Biochem Biophys Res Commun 377(2): 367-372. 9. Muller, J.M., Lelievre. V., Becq-Giraudon, L., et al. VIP as a cell-growth and differentiation neuromodulator role in neurodevelopment. (1995) Mol Neurobiol 10(2-3): 115-134. 11. Delgado, M., Reduta, A., Sharma, V., et al. VIP/PACAP oppositely affects immature and mature dendrite cell expression of CD80/CD86 and the stimulatory activity for CD4+ T cells. (2004) J Leukoc Biol 75(6): 1122-1130. 12. Weng, Y., Sun, J., Wu, Q., et al. Regulatory effects of vasoactive intestinal peptide on the migration of mature dendrite cells. (2006) J Neuroimmunol 182(1-2): 48-54. 13. Sacerdote, P., Ruff, M.R., Pert, C.B. VIP 1–12: a ligand for the CD4 (T4)/human immunodeficiency virus receptor. (1987) J Neurosci Res 18(1): 102–107. 14. Ruff, M.R., Martin, B.M., Ginns, E.I., et al. CD4 receptor binding peptides that block HIV infectivity cause human monocyte chemotaxis. Relationship to vasoactive intestinal polypeptide. (1987) FEBS Lett 211(1): 17–22. 15. Temerozo, J.R., Joaquim, R., Regis, E.G., et al. Macrophage Resistance to HIV-1 Infection Is Enhanced by the Neuropeptides VIP and PACAP. (2013) PLoS One 8(6): e67701. 16. Gilbert, C., Barat, C., Cantin, R., et al. CD4+ T Lymphocytes in HIV-1 Transfer from Dendritic Cells to Involvement of Src and Syk Tyrosine Kinases. (2007) J Immunol 178(5): 2862-2871. 17. Gilbert, C., Cantin, R., Barat, C., et al. Human Immunodeficiency Virus Type 1 Replication in Dendritic Cell–T-Cell Co cultures Is Increased upon Incorporation of Host LFA-1 due to Higher Levels of Virus Production in Immature Dendritic Cells. (2007) J Virol 81(14): 7672-7682. 18. Thibault, S., Fromentin, R., Tardif, M.R., et al. TLR2 and TLR4 triggering exerts contrasting effects with regard to HIV-1 infection of human dendrite cells and subsequent virus transfer to CD4+ T cells. (2009) Retro virology 6: 42. 19. Almeida, J., Bueno, C., Algueró, M.C., et al. Comparative analysis of the morphological, cytochemical, immunophenotypical, and functional characteristics of normal human peripheral blood lineage (-)/CD16 (+)/HLA-DR (+)/CD14 (-/lo) cells, CD14 (+) monocytes, and CD16 (-) dendritic cells. (2001) Clin Immunol 100(3): 325-338. 21. Shoda, H., Keishi Fujio., Yumi Yamaguchi.,et al. Interactions between IL-32 and tumor necrosis factor alpha contribute to the exacerbation of immune-inflammatory diseases. (2006) Arthritis Res Ther 8(6): R166. 22. Kodali, S., Ding, W., Huang, J., et al. vasoactive intestinal peptide modulates Langerhans cell immune function. (2004) J Immunol 173(10): 6082-6088. 23. Ding, W., Wagner, J.A., Granstein, R.D. CGRP, PACAP, and VIP modulate Langerhans cell function by inhibiting NF-kappaB activation. (2007) J Invest Dermatol 127(10): 2357-2367. 24. Janeway, C.A., Jr. The immune system evolved to discriminate infectious nonself from noninfectious self. (1992) Immunol Today 13(1): 11-16. 25. Matzinger, P. Tolerance, danger, and the extended family. (1994) Annu Rev Immunol 12: 991-1045. 26. Medzhitov, R. Toll-like receptors and innate immunity. (2001) Nat Rev Immunol 1(2): 135-145. 27. Akira, S.,Takeda, Kaisho,T. Toll-like receptors: critical proteins linking innate and acquired immunity. (2001) Nat Immunol 2(8): 675-680. 28. Kono, H., Rock, K.L. How dying cells alert the immune system to danger. (2008) Nat Rev Immunol 8(4): 279-289. 29. Foell, D., Wittkowski, H., Vogl, T., et al. S100 proteins expressed in phagocytes: a novel group of damage-associated molecular pattern molecules. (2007) J Leukoc Biol 81(1): 28-37. 30. Macpherson, A.J., Harris, N.L. Interactions between commensal intestinal bacteria and the immune system. (2004) Nat Rev Immunol 4(6): 478-485. 31. Sharpstone, D., Neild, P., Crane, R., et al. Small intestinal transit, absorption, and permeability in patients with AIDS with and without diarrhoea. (1999) Gut 45(1): 70-76. 32. George, M.D., Reay, E., Sankaran, S., et al. Early antiretroviral therapy for simian immunodeficiency virus infection leads to mucosal CD4+ T-cell restoration and enhanced gene expression regulating mucosal repair and regeneration. (2005) J Virol 79(5): 2709-2719. 33. Brenchley, J.M., Price, D.A, Schacker, T.W., et al. Microbial translocation is a cause of systemic immune activation in chronic HIV infection. (2006) Nat Med 12(12): 1365-1371. 34. Nijhuis, L.E., Olivier,B.J., de Jonge,W.J. Neurogenic regulation of dendritic cells in the intestine. (2010) Biochem Pharmacol 80(12): 2002-2008. 35. Frasca, L., Maria Nasso., Fabiana Spensieri., et al. IFN-gamma arms human dendritic cells to perform multiple effector functions. (2008) J Immunol 180(3): 1471-1481. 36. Yang, X., Meng, S., Jiang, H., et al. Exosomes Derived from Immature Bone Marrow Dendritic Cells Induce Tolerogenicity of Intestinal Transplantation in Rats. (2010) J Surg Res 171(2): 826-832. 37. Segura, E., Nicco, C., Lombard, B., et al. ICAM-1 on exosomes from mature dendritic cells is critical for efficient naive T-cell priming. (2005) Blood 106(1): 216-223. 38. Thery, C., Duban, L., Segura, E., et al. Indirect activation of naive CD4+ T cells by dendritic cell-derived exosomes. (2002) Nat Immunol 3(12): 1156-1162.